Kaua`i is the state of Hawaii’s fourth largest island and is also known as the “Garden Island”. Kaua`i’s formation comes mainly from volcanic matter, covered by mountains. The highest mountain, Kawaikini Peak, measures at 5243 feet above sea level. With the fertile soil on this island, fruits and flowers are abundant. Kaua`i is also known for its canyons, the deepest of which is Waimea, going 10 miles directly into the Earth. Most people have no idea that these canyons are so deep. If you are brave enough, you can take a guided expedition down the canyons (it is highly recommended not to take this trip on your own). Be sure to check out Na Pali Coast while on Kaua`i; it is breathtaking. The steep landscape, however, makes it impossible for road navigation, so tread carefully and consider seeing it from a chartered boat. Also, the wettest spot on Earth, with an annual average rainfall of 460 inches, is located on the east side of Mount Wai`ale`ale, in the very heart of Kaua`i. The main population centers of Kaua`i are Lihue and Kapa`a. The area of Kaua`i County is 552 square miles and combined population more than 58,000. Historically, Kaua`i was the last Hawaiian island to be added to King Kamehameha’s Kingdom of Hawaii in the 1800s due to strong resistance by Kaua`i’s ruler, Kaumuali`i. In face of threat and invasion, Kaumuali`i chose to join the kingdom without bloodshed in 1810. Just like most of Hawaii, the sugarcane industry was the first industry in Kaua`i. The first sugarcane plantation started operations in 1835 and in just 2 years’ time, it produced 2 tons of raw sugar. 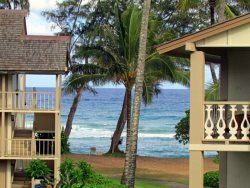 Kaua`i Law prohibits building any structure "higher than the palm trees"